Some of us are in our heads most the time, and others of us are for the most part heart-centered. But there is a third way to Truth, and that is the way of the body — the spiritual body. I suspect that Cora Fillmore was so; there are stories about her joyfully riding a bicycle around Unity Farm in a chiffon dress and about her love for healthy food. Her influence on Charles was remarkable. After their marriage he looked 20 years younger, he was able to let go of running Unity and he shifted to travel and speaking. Cora got Charles in touch with his body, in my opinion. And he was a healthier man because of it. There is a term for what happened to Charles — he got Cora-fied. I should know. I married a spiritual-body-centered woman, who I met forty years ago — a Feldenkrais practitioner, who's daily routine includes 30 minutes of affirmations, cooking organic soups and salads from scratch, teaching people how to get a good night's sleep and giving loving encouragement to our two daughters. I am a lucky man. Spiritual-body-centered people seem to have a sense of body energy that opens them to Truth in a way which is opaque to we who live in our heads and hearts. Many of them become chiropractors, and my impression is that there is an affinity between chiropractic and Unity. Clara Palmer is a notable example. By far the best example of that affinity is Dr. Leroy Dale, a chiropractor who ran the Unity Training School in the 1940's. Read his book. 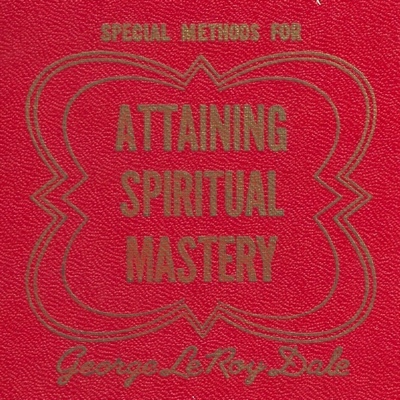 Dr. Dale's Special Methods for Attaining Spiritual Mastery is now available online in PDF and in full-text format. Here are sixteen, short 1-2 page "How to" chapters that help us to stay young, strong and healthy by the way we eat, breathe, sleep, meditate, work and relax. Here are eight suggestions on overcoming habits that range from gossip to alcoholism. 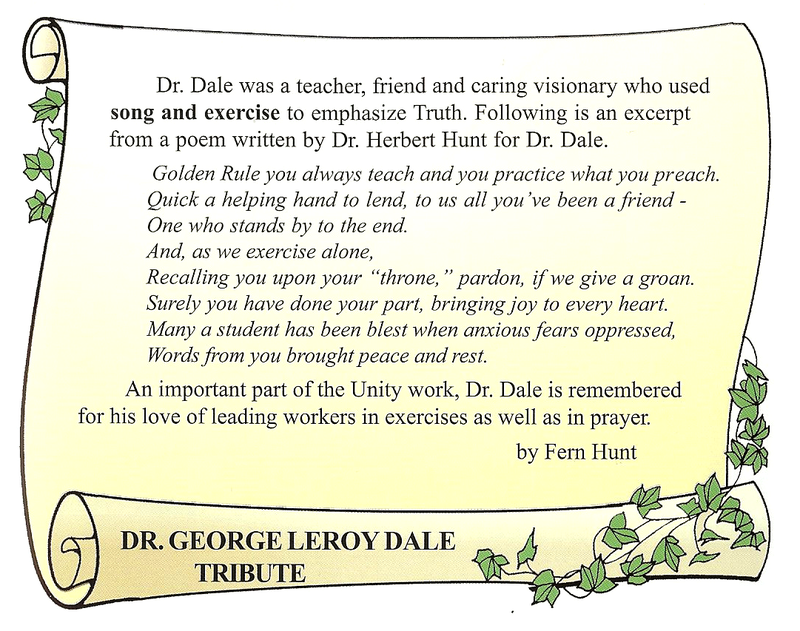 Here are extensive chapters on singing and exercise, two activities that Dr. Dale drilled into a generation of Unity ministerial students. And there is great wisdom in his advice about How to Achieve Happiness in Human Relationships and How to Understand and Practice the Golden Rule. You may look at the chapter headings and think Dr. Dale has given us a simplistic version of Unity. If so, you're in your head, or your heart. But you are not in touch with your spiritual body. The message is straightforward and simple for a spiritual-body-centered person — and tough as nails for a couch-potato, head-centered metaphysician like me. This sort of wisdom can only come from one who is in touch with the spiritual body — not the physical body, but the ideal, spiritual body. In my opinion, Unity, New Thought and what we collectively call metaphysical religion should claim it's rightful place in the historic Christian church. Unity is a confluence of Greek philosophy, Christian mysticism and Mind Cure. Without spiritual-body centered leaders like Dr. Dale, humanity would never have developed Mind Cure to what it is today — the understanding that the Mind and body are one. Richard Billings recalls George Leroy Dale. Go here for the full interview. 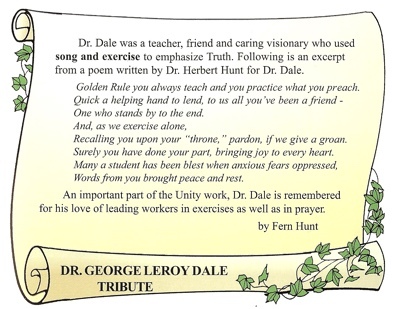 Thanks to Unity teachings and people like Dr. Dale, we now know that we are not a body that has a soul, rather we are a soul that expresses a body. We now know that the soul and Spirit are inseparable. And we now know that the body need never be separated from soul nor Spirit. Our body is not a problem, but rather it is a gift. Our physical bodies are not born in sin, rather they are born in bondedness to God. 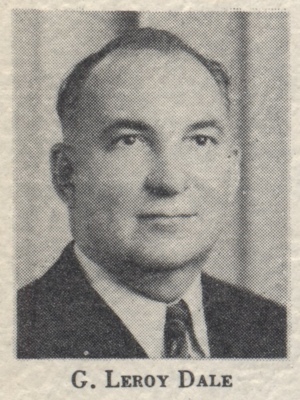 Without spiritual-body-centered people like Dr. Dale, we would never have understood the healing capacity of Jesus. I believe that this short book by Dr. Dale will challenge all of us to a healthier lifestyle and a more balanced spiritual journey.